This Winter School will be held from November 5 to 7 and will take place at Faculty of Psychology and Education Sciences of the University of Porto. This event is aimed at discussing several characteristics of high-quality intervention research, including research designs, ethics, randomized controlled trials, data analysis, reporting, and publishing. 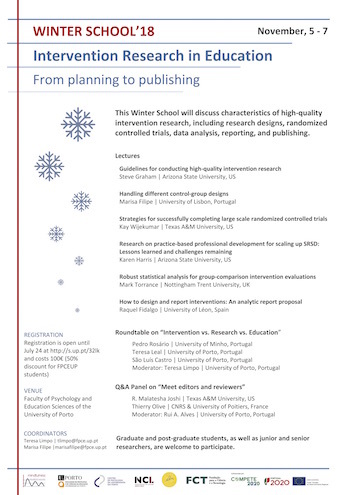 In addition to these activities, participants will also be asked to develop their own intervention research project, which will be presented and discussed at the end of the Winter School.